As many of you already know, the issue of forgiveness has been a compelling interest of mine for many years, and I have devoted considerable time and attention to exploration of that concept, and penned lots of words in the process. A study series that I call Forgiveness ‘By the Book’ is one of the results of that effort, and I will be offering the basics of that series, Lord willing, at Grove Avenue Baptist Church on June 22-26, 2014. I would be very grateful for your prayers that God will make it stimulating, informative, and most importantly, fruitful. The series will be offered as one of the adult offerings during their Vacation Bible School program, which is great on two fronts for those of you who might be interested in attending and who have school-aged children. You have the opportunity to participate in the adult study, and your kids will get to have an exciting learning experience at their level, as well. Both VBS and the study series will take place nightly from 6:15 to 8:30 pm. A flier is posted on the Events & Opportunities page if you may be interested and want a little more information. Since I have brought up this matter of forgiveness, I might as well share a brief glimpse here. In exploring the matter of forgiveness, we highlight the importance of relationships, because the primary objective of forgiveness is the restoration, redemption, and repair of broken or damaged relationships. In that effort, we take a journey of sorts back to that time in human history when the idea of forgiveness didn’t exist at all. In the quest to understand how any principle works, it’s always very helpful to see how and why it was developed in the first place. Understanding how and why it came to be is an invaluable aid in grasping its purpose and defining its objectives, and, of course, in applying it effectively. So, we find ourselves back at the very beginning, where we encounter this. “… the LORD God planted a garden eastward in Eden, and there He put the man whom He had formed, and out of the ground the LORD God made every tree grow that is pleasant to the sight and good for food” (Genesis 2:8-9a). From that pleasant and productive orchard of delights, God singled out two trees and endowed them with unique names and profound significance. “The tree of life was also in the midst of the garden, and the tree of the knowledge of good and evil” (Genesis 2:9b). 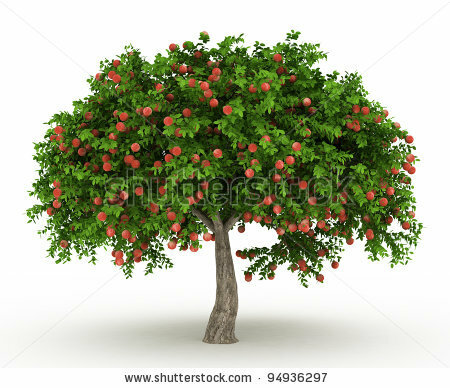 These trees were singled out by their Creator because of the unique character of the fruit that each bore, and the profound significance that that fruit would have on the newly created inhabitants. One was called the tree of “life”, and though it wasn’t the name God gave it, the other tree could accurately have been called ‘the tree of death’. Regardless of its name, the fruit from that tree was spiritually and physically toxic, and ingesting it was lethal. Thus, there was a restriction established, and eating from that tree was forbidden. That the trees were placed there at all is fascinating to contemplate, but the implications associated with God’s management of man’s access to their fruit is even more so. We know at least three things initially in reference to those trees. We know God wanted them there. We know that He wanted them accessible, and we know that He did not want Adam and Eve to eat the fruit of one of them and took measures to protect them from it. His choice of preventive procedures is interesting, given the profound implications associated with access to that fruit. God ‘surrounded’, if you will, that tree’s fruit with a boundary. That makes sense, given the extent of its lethal qualities. What is somewhat perplexing is the kind of boundary He chose, because the boundary was not physical. There is nothing to suggest that there were any physical signs or indicators in place, such as God maybe taking a stick and drawing a line in the dirt around the tree and saying, “Don’t you guys ever step across that line, and if you do, an alarm is going to sound in My office. I’m going to know you did it, and there’ll be hell to pay.” A strategy like that might make sense to us, but God didn’t choose to go in that direction. In spite of the gravity of the threat, God’s only protective boundary was a brief, uncomplicated, verbal statement. Why did He not build a high wall around the tree, or even the whole area—maybe put some coiled razor wire all around the top of it? God had a boundary, but no barrier. That could be considered peculiar. The tree and its fruit represented the potential destruction of everything precious to the heart of God. Why not build an impenetrable barrier around it and keep everyone out? Answering the insistent ‘why’ question isn’t difficult. It lies in the heart and at the core of the nature of God Himself. Though it sounds overly simplistic, describing God as being ‘all about relationships’, it would be nonetheless accurate. The entire world He created is a living demonstration of complex interconnected relationships—a collection of vastly diverse systems and sub-systems at every level, and all designed to move and function in a state of interdependence and harmony with one another. That’s God. He made them that way because He is that way. Human relationships, like everything else He made, were designed to be reflective of His own primary nature and character, and meant to function for Him as a means of Self-revelation. Because the concept of love is at the core of His nature, it is not surprising that intimate human relationships, as a whole, share many of the same characteristics as love itself. For instance, they are always voluntary, optional, and laden with potential for indescribable joy on one hand, and excruciating pain on the other. To make them otherwise would be to functionally dismantle them or eliminate them altogether, and either one would strip them of every meaningful quality and rob them of any benefit that God built into them. Boundaries were placed around that tree’s fruit because God’s objective with His new creatures was to have an intimate relationship them. Love based relationships are established in the context of boundaries, and to a large degree are even defined by them. Love relationships are built on trust alone, and that trust inherently involves certain limitations requiring self-control and voluntary restrictions. If a guy said to his wife, “Honey, I love you, and I trust you – and to prove it to you, I’m going to lock you in a cage in the basement so you won’t be tempted to hang out with some other guy when I’m not around,” I suspect she’d have issues with that arrangement. Do you recall the story of the 11-year-old girl, Jaycee Dugard, who was abducted and held captive by Phillip Garrido for 18 years? Her abductor allegedly forced intimate contact with her, but that’s not a ‘relationship’. Our primary relationships will not be protected by physical barriers—and if they are, professional help is needed—but they will always have boundaries whose enforcement will depend on love and trust. Violating those boundaries will always have destructive consequences, but if we seek to make violations impossible, then we no longer have a relationship, we have some form of slavery. The recognition of boundaries and their role is vital to understanding how forgiveness works and why it works the way it does. If this glimpse into God’s plan for forgiveness and restoring broken relationships piques your interest, I look forward to the hope of joining with many of my readers at this study series at Grove Avenue Baptist Church later this month! This entry was posted in Forgiveness, Insights and tagged Burglars, Forgiveness. Bookmark the permalink. Ron, Your teaching is clear and concise. I think it is essential learners are given the mechanics of the problem solving process. I commend you for your teaching method. May the Lord multiply your teaching ministry. Wonderful. You are definitely gifted for the ministry you teach. Met you at the RCCW meeting. Couldn’t wait to check out your website. Fortunately, my sister and I found seats beside you. “All things work together for good for those that love the Lord” manifested itself yesterday. What a simplistic approach to ‘boundaries’. Had never looked at them in this way. Thank you!